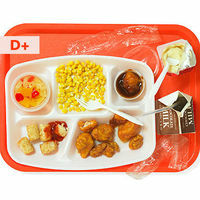 Is your child’s cafeteria failing to provide healthy, nutritious food? Deep-fried popcorn chicken, tiny taters, bread, barbecue sauce, ketchup, milk. That high-fat, high-sodium, low-fiber menu is a typical lunch at a typical American elementary school. We know about it because Mrs. Q., a grade-school teacher, decided to eat her school’s lunch every day for an entire school year and report anonymously to the world on her blog, “Fed Up With Lunch: The School Lunch Project” (fedupwithschoollunch.blogspot.com). What she discovered about our kids’ midday meals is sobering if not surprising: Menu mainstays routinely feature fatty items such as pizza, french fries, hot dogs, and a mystery pork product called “ribicue.” She’s eaten beef with fake grill marks and lots of sweetened fruit cups. It doesn’t have to be this way. At Galtier Magnet Elementary School, in St. Paul, Minnesota, menus include whole-grain bread and pasta, along with unsweetened applesauce for dessert. There’s also a salad bar stocked with greens, carrots, peas, and grape tomatoes. A sauce station offers seasonings — low-fat ranch dressing, soy sauce, Louisiana hot sauce. Many of the kids in St. Paul still eat tacos and macaroni and cheese, but the cafeteria makes lower-fat versions of both. They also get edamame and chicken stew, which add vital nutrients into their diet. While even detractors acknowledge that the quality of most American school lunches has steadily improved over the past 15 years, everyone from nutritionists and public-health experts to the First Lady — not to mention a growing number of extremely frustrated parents — believes that our children’s school lunches are still overprocessed affairs laden with unhealthy preservatives, sodium, sugar, and trans fat. Nutritional quality varies widely from district to district, but according to the USDA a typical school lunch far exceeds the recommended 500 milligrams of sodium; some districts, in fact, serve lunches with more than 1,000 milligrams. The USDA also reports that less than a third of schools stay below the recommended standard for fat content in their meals. “School lunches hardly resemble real food — they serve items such as chicken nuggets, which are highly processed, with additives and preservatives, and list more than 30 ingredients instead of just chicken,” says Marion Nestle, Ph.D., professor of nutrition food studies and public health at New York University. Nuggets are only one example of how schools rely on too many foods that are heavily processed and high in sugar, sodium, and chemicals. The problem isn’t simply that kids are eating unhealthy foods for lunch. The cafeteria’s offerings also give a seal of approval: “Kids associate school with education; therefore they get the wrong impression that these kinds of foods are healthy,” says Dr. Nestle. That disconnect shocked Lolli Leeson, a wellness educator and parent, when she volunteered in her kids’ lunchroom in Marble-head, Massachusetts. After 15 minutes, the students were allowed to throw out their lunch and buy junk food, such as cookies, candy, and chips, from the à la carte menu. “The kids were taught a bit about nutrition in the classroom, but the school was being hypocritical in not modeling it in the lunchroom,” she says. We take it for granted that these are the foods that kids want to eat. But most experts disagree. Sam Kass, Mrs. Obama’s food-initiative coordinator, has been spending a lot of time visiting schools and hosting children at the White House garden as part of Mrs. Obama’s Let’s Move! campaign. “When the First Lady planted and harvested the garden with kids and then cooked a meal with them, those kids ate salad like it was going out of style — like it was french fries — and they ate peas like they were the best thing they had ever tasted,” says Kass. The food kids eat for lunch around the world is evidence that what we think of as kid-friendly is more nurture than nature. In France, menus include beet salad, pumpkin soup, and veal stew. Korean students eat kimchi and stir-fried beef with carrots. In fact, the successes at Galtier Magnet School, where 80 percent of all the elementary students eat what’s prepared at school, and at other districts throughout the country, prove that it is possible to serve meals that are healthy, appeal to kids’ taste buds, and offer important lessons about the value of good nutrition — instead of being based on children’s whims. “We don’t allow kids to not learn about Shakespeare,” says chef Ann Cooper, aka “The Renegade Lunch Lady,” who overhauled the Berkeley, California, and Boulder, Colorado, school-lunch programs. “Why would we allow kids to decide that they don’t want to eat green food?” The urgency over what our kids are eating is due to some scary facts: Children born in the year 2000 have more than a 30 percent chance of developing diabetes during their lifetime, according to a study published in The Journal of the American Medical Association, and the Centers for Disease Control and Prevention (CDC) reports that 16.9 percent of children between the ages of 2 and 19 are already obese. At its core, the National School Lunch Program is a noble institution. Started in 1946 by President Truman to provide lunches to school-age children, the program was founded on the principle that keeping children healthy is vital to America’s prosperity. But even that basic mandate has become a complicated issue. Take milk, for example: Chocolate milk, for decades a school-cafeteria staple, has double the sugar content of unflavored milk, and some school districts, including Washington, D.C., have banned it while others are trying to reposition the drink as a dessert and limit when it’s offered. (For example, Chicago schools serve it only on Friday.) But flavored milk’s defenders can be found among the ranks of parents who fear that their children will miss out on crucial vitamin D and calcium because they won’t drink the unsweetened variety. The dairy industry, naturally, is also supportive: “It’s important to know that flavored milk provides the same nine essential nutrients as white milk, while contributing only 2 percent of the added sugar in a child’s diet. There are more valuable places to look if you’re trying to reduce sugar, like sports drinks, sodas, and other empty-calorie beverages,” says Ann Marie Krautheim, R.D., a spokesperson for the National Dairy Council. It’s unfair to place all the blame on the schools, especially in these budget-strapped times where lunch programs are under pressure to break even. As Mrs. Obama told a national meeting of school-nutrition professionals back in the spring: “If you asked the average person to do what you do every day, and that is to prepare a meal for hundreds of hungry kids for just $2.68 a child — with only $1 to $1.25 of that money going to the food itself — they would look at you like you were crazy. That’s sad, but that’s less than what many folks spend on a cup of coffee in the morning.” When districts do want to make changes, even what seem like small tweaks start to add up; switching to 100 percent whole-wheat bread (which contains more protein, fiber, vitamins, and minerals than white bread) costs Seattle Public Schools an extra $20,000 each year. Both Dr. Nestle and Dr. Poppendieck recommend making school lunches free to all students. Doing so, they argue, will allow schools to put money spent on administering the current tiered system into improving the actual meals. With less pressure to lure paying students into the lunch line, food-service departments could concentrate on healthier foods. But many of those sweeping changes aren’t in the cards yet. In fact, President Obama’s plan to reauthorize the Child Nutrition Act has been scaled back to call for only six additional cents per meal. Although the funding increase is not enough to ensure that every American child will eat like the students in St. Paul, experts agree that the attention school lunches are getting in the media and the halls of Washington, D.C., should make it easier for parents to change their communities’ school lunches. What should those changes be? Margo Wootan, the nutrition-policy expert at the Center for Science in the Public Interest (CSPI), along with other advocates, says the first priority should be to increase the amount of fruits and vegetables offered at every meal. They would also like school-nutrition services to set maximum calorie targets rather than minimums — a practice that was started when the goal was to fight malnutrition. Switching to whole grains and low- or nonfat milk, getting rid of products that contain trans fat, and limiting sodium are the other goals rounding out their wish list. As anyone who has gone up against a school-lunch program knows, change can take years. That’s why even if your child is just a toddler, it’s not too early to start pushing for better food. When Weston, Connecticut, mom Amy Kalafa realized what was being served in her children’s lunchroom, she made Two Angry Moms, a documentary about what’s wrong with school lunches and how parents can improve them. Kalafa’s film follows the efforts of Susan Rubin, a mom who had been working for more than a decade to improve the lunches in her children’s schools in Westchester County, New York. The film takes viewers through Rubin’s successful crusade to get items such as neon-green slushies, supersize cookies, and greasy fries off the menu. In an ideal world, schools would serve more organic food, but most experts say that the current economic climate means that we need to set doable goals. Focus on requesting more fresh fruits and veggies, and adding whole-grain bread products. According to the Center for Science in the Public Interest, the notion that schools need to sell junk food to raise revenue is a myth. USDA studies have shown the average school uses revenue from NSLP meals to offset the costs of producing à la carte options. Kids love events with food. Hold a fruit festival where parent volunteers offer pears, papayas, and more. Or get students invested in what’s being studied in class. If they’re learning about the Middle East, try a tasting with hummus and tabbouleh. Plant a school garden, connect with a local farm, or just plant pots of herbs for the classroom windowsill. “When children grow food themselves, they want to eat it,” says the founder of the fresh and local food movement in the United States, chef Alice Waters. Researchers at Central Washington University, in Ellensburg, found that when recess was scheduled before lunch, students consumed significantly more food and nutrients than when play was after lunch. Everyone from lunch reformers to cafeteria managers insists that the best way to be informed is to experience it yourself. Reading weekly menus is no substitute for seeing, smelling, and tasting the food — as well as checking out the ambience. 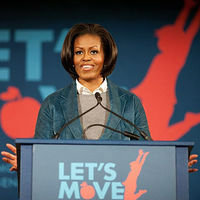 First Lady Michelle Obama has set an ambitious goal: to end the childhood-obesity epidemic within a generation. To do so she’s advocating for better food labeling, encouraging increased physical activity, engineering access to nutritious food for all Americans, and demanding healthy food for our nation’s schools. As she told us in June when Parents visited the White House, “The school piece remains a critical part [of the campaign], because millions of kids are getting two meals a day at school.” The plan: fighting against the conventional wisdom that children won’t eat food that’s good for them by encouraging everything from school gardens to partnerships between local chefs and lunchroom staff. 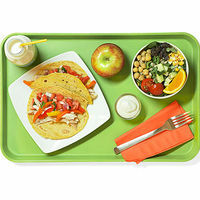 Click here to find assistant White House chef Sam Kass’ healthy lunch recipes. Even if you’re packing lunch this year, your kids could be on the cafeteria line next year. Check out these resources for advocating for nutritious school food. The Lunch Box Chef Ann Cooper offers information and advice for parents and schools wanting to make the transition to healthier meals. Includes everything from recipes to budget planning. Food Politics Nutrition and food-policy expert Marion Nestle, Ph.D., has a site that’s a must-read for staying in the know about how politics shapes what goes on our kids’ plates.